The history of pro athletes acting like rock stars/rappers off the court (sometimes on) is undeniable. Musicians and actors also admire their favorite sports stars as well, whether sitting court side or donning a jersey in the video. The trouble happens when they cross the lines thinking they can perform like the experts in the other's field. The latest crossover hopeful comes from Philly's very own DeSean Jackson. The wide receiver for the Philadelphia Eagles is not known to be shy and has a tankful of ego, so making a blinged out music video would make sense to him. The song is called "Diamonds on My Neck" released on his own record label and produced by L.T. Hutton. It features some good company in Snoop Dogg. The video itself is slickly produced showing them driving around Las Vegas, hanging with some girls, and them dancing in various locations. 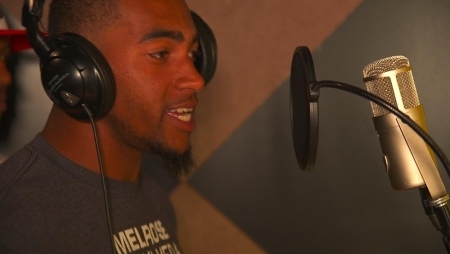 DeSean only makes a vocal appearance for a short verse in the song, it wasn't that bad. I'll suggest focusing on the upcoming training camp and forget the rap career until February. No catches on the field = no money to pay for diamonds or elaborate music videos. Reminds me of another Philly athlete releasing a foray into hiphop about 10 years ago, remember Allen Iverson's aka Jewlez "40 Bars"? It not that bad listening back to it now. It's definitely not as bad as Deion Sander's "Must Be The Money" or will be as prolific as Shaquille O'Neill's entire discography.